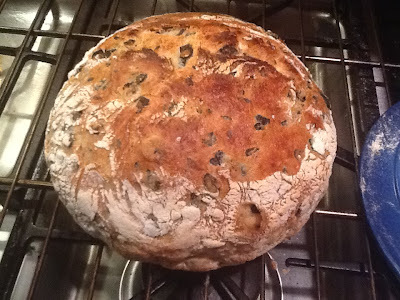 No-Knead Olive Bread - Inspired by Jim Lahey's "My Bread"
I've always wanted to try my hand at baking bread. And I finally found both the motivation and the method to give it a try. My local Safeway grocery store sells the most incredible olive bread in their bakery. The only problem is that it costs about $4.00 a loaf and it often sells out. So this weekend I was trolling google, randomly looking up recipes and decided to look up 'olive bread'. I was intrigued by the mention of a 'no-knead' method that I read about on several blogs, all of which pointed back to the originator of the method and his book: baker Jim Lahey's "My Bread" (a fantastic cookbook). I managed to pick up a copy of "My Bread" at my local library this afternoon. After I made the bread and saw the fantastic results using Jim Lahey's no-knead technique, I plan to buy the book to add to my cookbook library. Yes, his book is that good. Jim's recipe says that you can use any pitted olive, though he prefers kalamata olives. After making my first loaf with the generic black olives I had in the pantry...I immediatly went to the grocery store and bought kalamata olives...there really is a taste difference. The pinch of salt is a matter of personal taste and may not be necessary if you're using the more robust kalamata olive. The rosemary is my personal addition to this recipe (yes, it's in the Safeway loaf). 2. When you uncover the bowl, your dough will have risen to twice its original size and will be filled with bubbles. Scrape the dough out onto a well-floured surface. Turn the edges of the dough under to form the dough into a plump round. 3. Take a clean dish towel, lay it out flat on your work surface, flour it well, and then place the dough, seam side down on the towel and lightly cover the dough. Allow the dough to rise for a second time for two hours. The outside of the dough will be covered in the excess flour, which you want...you can also lightly dust the outside of the dough with cornmeal for added texture. 4. During the last 30 minutes of the rising time, pre-heat your oven to 475-500F. And here's the interesting part...heat your 5-quart dutch oven (without the cover if it has one of those handles that won't tolerate the heat) in the oven, so that's it's screaming hot. 5. CAREFULLY, open the oven door, slide out the very hot dutch oven, and plop the dough (seam-side up) into the cast iron pot. Place the lid on the pot and bake for 30 minutes. After 30 minutes, remove the lid and let the bread cook for another 20 minutes uncovered, keeping an eye on the bread for done-ness. The top of the bread will become very brown. 6. Remove the bread from the oven, and then from the cast iron pot and let cool for an hour on a wire rack. According to Jim's recipe, this cooling step is just as important as the rest of the steps, so the bread can finish cooking inside and you don't end up with a damp interior. I can't wait to make the next loaf. As you can see, it's incredibly easy, delicious, and will impress your friends and family. Give it a try and then let me know the results. And then buy Jim's book. If you're a bread lover like me, you'll be hooked immediately.